I preach a message series from time to time called Great Chapters of the Bible. People often complain about the sinners they find in the local church, and with good reason. It’s filled with sinners, which is why Paul calls Christians to love one another by bearing all things, believing all things, hoping all things, enduring all things. If you won’t love such backstabbers and defrauders like this, don’t talk about your spiritual gifts, your vast biblical knowledge, or all the things you do for the poor. You’re just a noisy gong. Don’t talk about your love for all Christians everywhere; you are just a clanging cymbal. But if you do practice loving a specific, concrete people, all of whose names you don’t get to choose, then you will participate in defining love for the world, the love which will characterize the church on the last day perfectly because it images the self-sacrificing and merciful love of Christ perfectly (The Surprising Offense of God’s Love, 211). 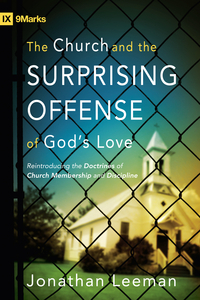 What could be more relevant to excelling at guarding your church’s peace than growing in love? To receive a free mp3 of this, one of my all time favorite talks, drop me your email and I’ll send it to you!